#204 is a short type with a total length of 31 mm. Because these are short type, the stack rack for 96 tips is very compact. The package with 5 stacked or 10 stacked racks are convenient. 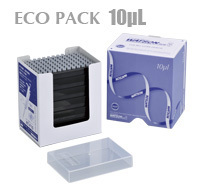 "ECO PACK 10uL" is a product with 5 stacked and sterilized racks. Please Use with a empty rack (1298-254RA). Other capacity "ECO PACK", 200uL, 1000uL is also available. "123P-2104C" is a product with 10 stacked. Stacked replacement plates for System Rack, which is space-saving. *please autoclave after setting into tip rack.